I wore Minnie Mouse ears in public. I can’t believe I’m saying that. I’m not into fancy dress costumes and despise those paper Christmas cracker hats. Yet I happily walked around Tokyo Disney Resort wearing fluffy pink ears and heart-shaped sunglasses. Why? Because almost everyone else there was wearing them and they looked so happy, like these two girls. I got swept-up in the party-like atmosphere. I visited Tokyo Disney Resort (as a guest of their parent company) to check out their 30th anniversary celebrations – Tokyo Disneyland was the first Disney park to be built outside America in 1983. You can read all about the celebratory activities, including the new Star Wars: The Adventures Continue ride, in my article in News Ltd’s Escape travel section. 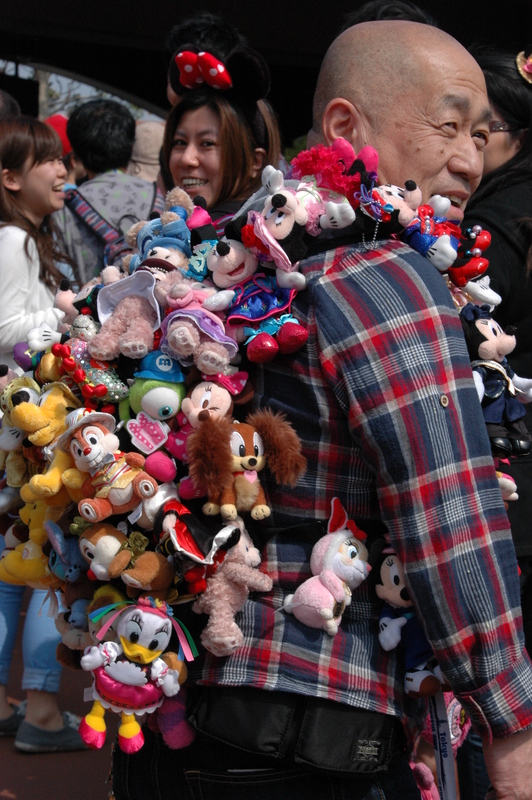 Ninety-seven percent of visitors to Tokyo Disney Resort are Japanese and approximately 90 percent of those are return visitors. Needless to say, the majority of park patrons are ‘into’ Disney, in a big way. 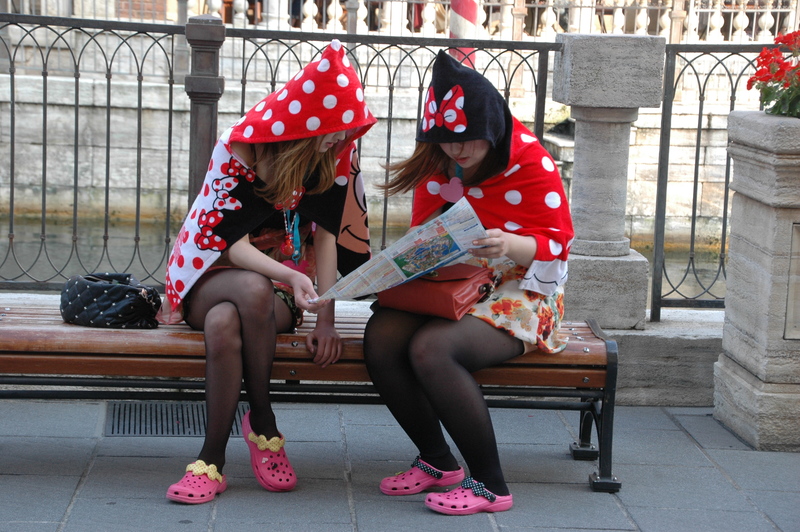 They are excited to be there and dress for the occasion – in Disney gear. The more, the better. It was mesmerising and I had as much fun people-watching as riding the attractions. Here are some of my favourite Disney fashionistas. Every little girl want to be a princess sometimes. Aren’t these two gorgeous? 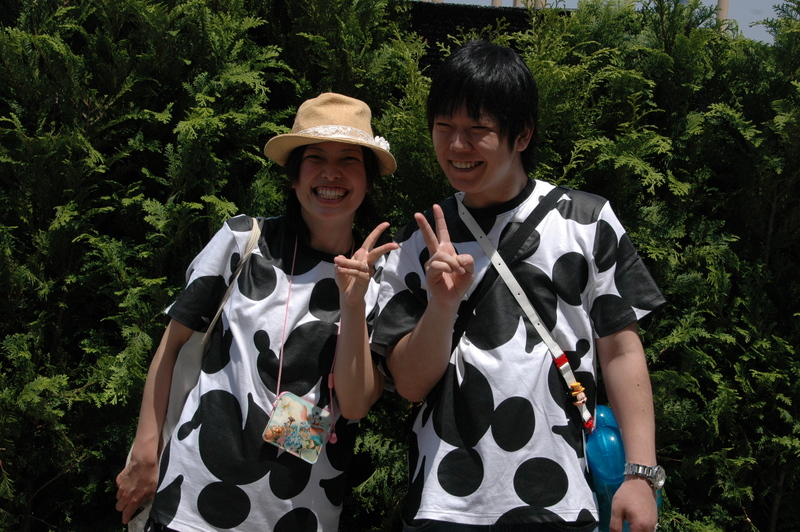 Mickey silhouette T-shirts are very popular. So are matching outfits, for both guys and girls. 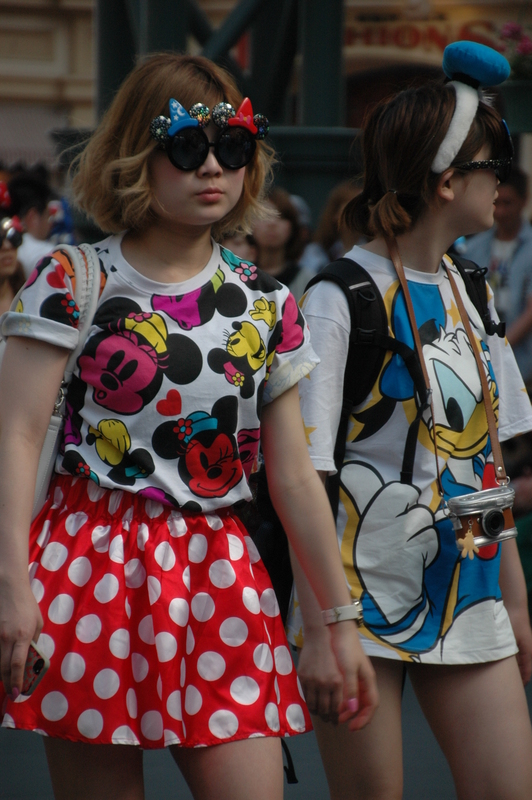 Disney T-shirts come in hundreds of designs. 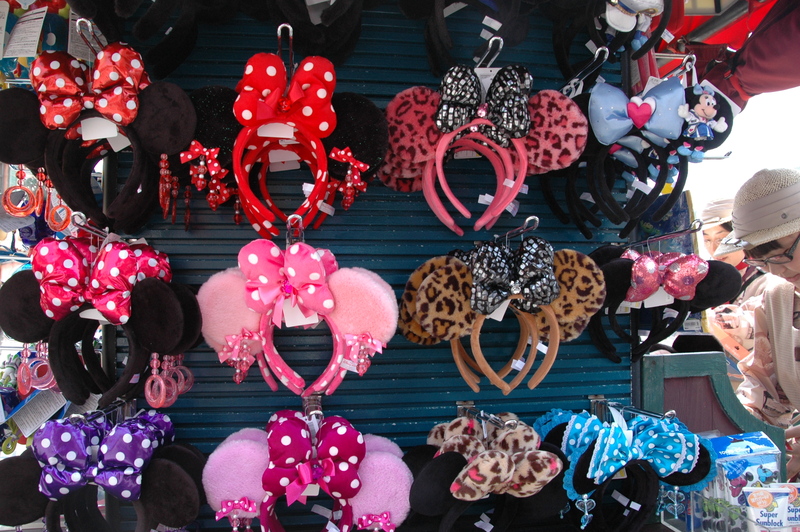 No black plastic Mickey ears, but plenty of others to choose from. You don’t have to wear Mickey ears. 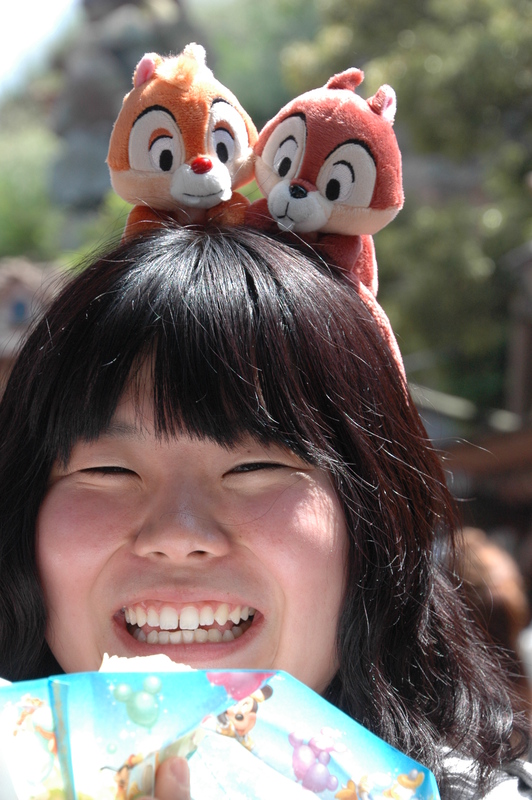 There are Dumbo ears, Donald hats and Chip ‘n’ Dale headbands. 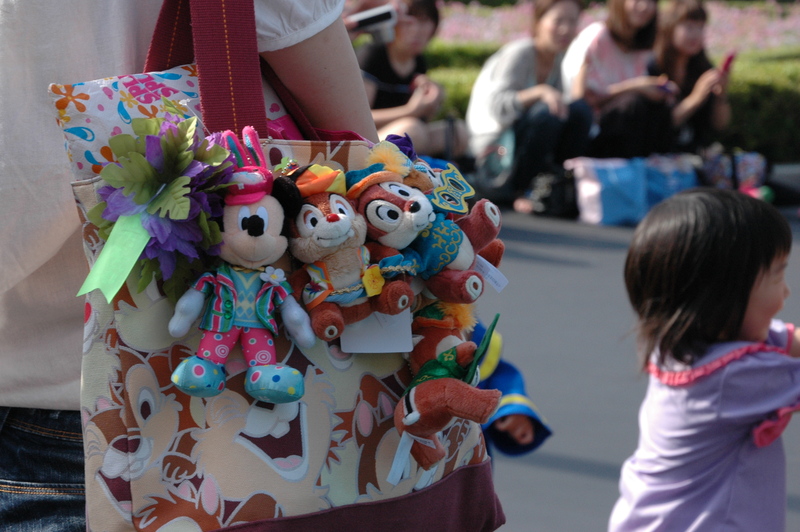 Accessories rule, especially Disney characters dripping from handbags. Or covering backpacks. Now this guy is a serious collector. Hooded Disney towels are a fashion accessory too, worn as shawls and worn with pride. But these two girls are my favourites. 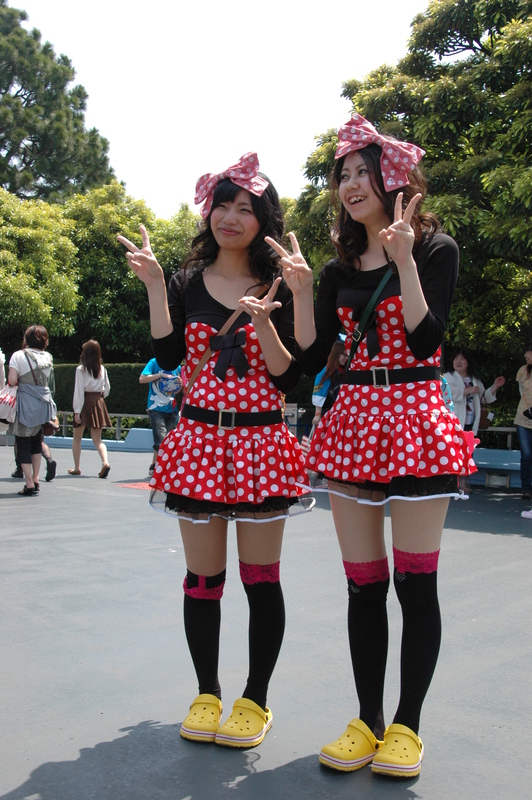 Don’t they just look dashing in their matching Minnie dresses – and so cheerful. Happy 30th Birthday Tokyo Disneyland! And thanks for the memories. 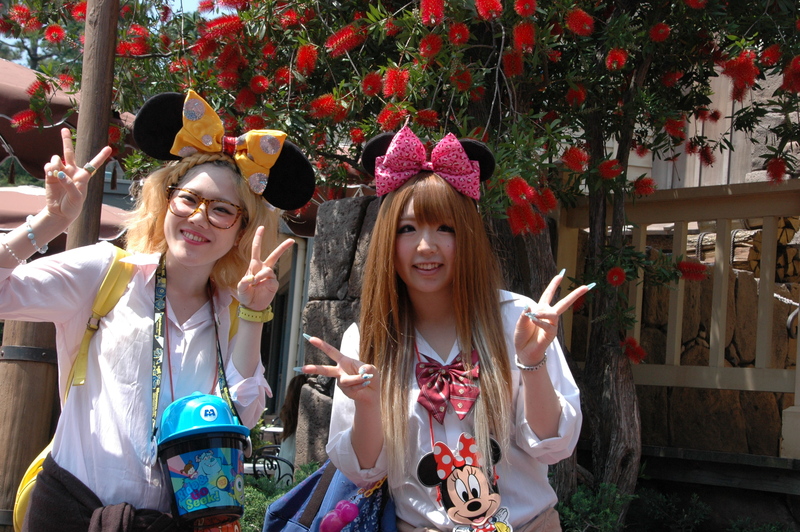 This entry was posted in Japan, Tokyo, Travel and tagged clothing, family fun, fashion, minnie mouse ears, Tokyo Disney Resort, travel. Bookmark the permalink.